If you are so incredibly sick of squash… please shield your eyes. Apparently the butternut is my new pumpkin this season. Even my new bacon. My new chocolate? My new cupcake? I’m well aware that I might be overdoing it but I can’t stop. It’s not that I even totally enjoy the squash when it’s plain or simply mashed… but I absolutely adore it when it’s combined with some cheese and nutmeg to create that magnificent fall dish. It’s like my autumn trifecta of flavor. And don’t even forget that brown butter. As if. The good news is… I think I’m out of squash dinner ideas for 2012. And the bad news is that I think I’m out of squash dinner ideas for 2012. But… pretty sure we have quite a few to hold us over if that is the case. Although I’m seriously tempted to puree some caramelized butternut with mascarpone and provolone and spread it on a pizza crust, then top it with brown sugar coated red onions, bacon and fried sage. And more cheese. Think I’ll leave that one up to you though. Won’t hate it if you show up on my doorstop, pie in hand. Puhhhhhlease make that happen. On a totally unrelated but still very related subject, why are there no butternut squash candles? I mean, I’m definitely not for the let’s-make-vegetable-scented-candles trend, but I think a brown butter butternut candle would go over quite swimmingly. Maybe I will take up a new hobby. Because you know, I sniffed the Thanksgiving candle at Bath and Body Works this weekend and sort of wanted to die. Butter scented candles are cool, and I even love the bread scented ones too, but a turkey, mashed potatoes, stuffing, butter and cranberry scented candle? Like all in one? No thank you. Did not float my boat one bit. So these enchis are kind of like last week’s lasagna – very customizable. You don’t want the squash super soft before it dives head first into the tortillas because it will be total mush, and we need some texture here. Perfectly cooked squashed with a protein of your choice works best. White beans are my favorite, but I tried chickpeas as well and actually enjoyed the firmer chew. You can add chicken or sausage or beef, use different cheeses, even change up the sauce if you wish. The deal shown here contains the squash and beans drizzled with a hint of brown butter and spiced with nutmeg, rolled in whole wheat tortillas then showered in a sauce with gooey fontina. We should probably just make that a candle. Yes? 1 cup milk I actually use vanilla almond milk – perfect! Preheat oven to 375 degrees F. Lightly spritz a 9×13 dish with nonstick spray. Heat a large skillet over medium heat and add olive oil. Add onions, garlic and sage, cooking for 2-3 minutes until slightly softened. Toss in squash, salt, pepper and 1/4 teaspoon nutmeg, stirring well to coat. Cover and cook for 8-10 minutes. You don’t want to overcook the squash because it will be mushy, so cook until it’s slightly tough but you can bite through a few pieces. Make sure to taste 2-3 pieces! Once finished, stir in beans and mix well. Remove squash and bean mixture, placing in a large bowl and drizzle with brown butter, then toss with 1/2 cup fontina. Set aside. In the small skillet, raise the heat to medium-high and add butter. Once sizzling add in the flour and whisk for 2-3 minutes until a golden, nutty roux forms. Pour in stock and milk, whisking again until bubbly and slightly thick. Reduce heat to low and stir in 1 cup of fontina, stirring until combined. Add in remaining nutmeg and taste to season with additional salt and pepper if desired. Spoon about 1/3 cup of sauce into the bottom of the baking dish, then spoon a few spoonfuls of the squash mixture in the center of each tortilla, rolling up tightly. Place all the rolled tortillas carefully into the dish, then cover with remaining sauce. Sprinkle with the rest of the cheese and some extra chopped sage. Bake for 20-25 minutes, until cheese is bubbly and melted. Serve immediately! Autumn is just the bees knees. 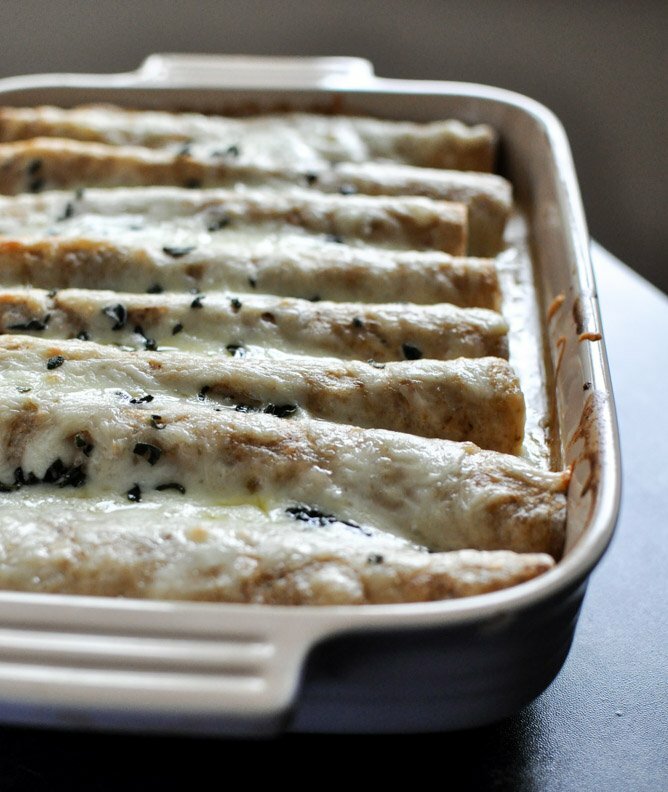 These enchiladas look so delicious AND they’re healthy. Love that! I thought I was sick of squash, too, until you put the idea for butternut squash enchiladas in my head. Yeah, Fall! And I would defo get in on that butternut candle train, woot! Mmmm…keep the squash recipes coming! I’m a year-round fan! Was your Vanilla Almond Milk sweetened or unsweetened? Check Pier 1 for brown butter butternut squash candles. They have every awesomely weird scent you never thought you needed. This looks sooooo great. Have you tried simply dicing it up and roasting it with coconut oil, cinnamon, and salt? Amazing! HOLY GOOD GOD. I can’t wait to make these! Pingback: Monday Blues. | Write. Cook. Travel. Live. I made these tonight. And then I died. Seriously. I took a bite, passed out and collapsed on my floor – and was revived by the scent of absolute deliciousness. I also added spinach to the butternut squash, onions, garlic and beans. It was out of this world. I’m basically leaving Jesus behind. Jessica-ism all the way. Oh, this is naughty. I’m sorry you’re out of butternut squash recipes. I have a big one on my counter right now and I’m trying to decide what to do with it! I’d be on board with that candle, by the way. I made these tonight with my mom and sister along with your recipe for Apple Cider Sangria. Both were absolutely delicious! I’m loving all the b-nut squash recipes! It’s my absolute favorite!! This looks so delicious! Such a great option for a meatless meal. I have been all about the butternut squash this year too! 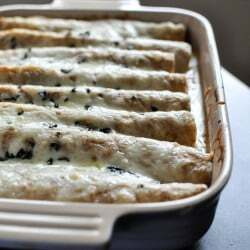 These enchiladas sound heavenly and think the beans and squash could stand on their own without any meat! I made them the night I saw your post too! They were really good. Creative twist on the enchilada. i just made a version of these and they were INCREDIBLE!! thank you for the great ideas always – the garbanzo beans with the squash so perfect. Just made these for my boyfriend who just came back in town after a long trip.. He literally proposed after the first bite !! He took it back but still… These are insane. This is the third recipe I have tried of hours and I can’t wait to try them all! I made these tonight, came out delish! I added chicken and spinach to make a complete meal. Will def make it again. Making this for the second time! Threw in a thawed + drained pack of frozen spinach for kicks, and I miiiiight have gone nuts with the fontina (just kidding–that’s impossible). Also scalded the milk the second time around before I added it to the roue, which made the cream sauce thicken really nicely and quickly. Love this recipe Jessica. Just wanted to let you know!! My husband and I made this recipe tonight and it was awesome! All of your recipes/dishes are delicious! Pingback: Annapolis & Company - our weekend link-up party! I’ve made these twice now and they are GREAT! Admittedly, the second time I didn’t have fontina so I took a gamble and did a parmesan/cheddar/swiss trio of what was left in the fridge, but it still turned out rich and delicious. I like the idea of adding spinach so I’ll try that next time :) Thank you for posting this one! 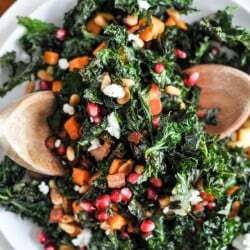 Just came across this recipe and want to make it – looks amazing! Silly question: what size tortillas did you use? Would this be a good freezer meal? At what point would you freeze it? These were tasty but they required a fair amount of prep work and dirtied a lot of pans and dishes. Also, the ingredients are out of order, which made following along as I cooked a challenge. I used the same skillet to cook the veg and the sauce. I also used Jarlsberg cheese instead of fontina. I used soft-taco-sized tortillas and they were overstuffed, so if I make again, I’m going to use fewer cups of butternut squash. All in all, it’s a delish vegetarian take on enchiladas that has no tomato sauce in sight, but I’ll be tweaking it a little next time.